The end of the year is traditionally the time to sum up and outline the ways for reaching new heights. The well-being of the regions is largely determined by investment activity, which in Tatarstan is represented by an extensive infrastructure and a large number of companies from different countries. On December 19, this had been exemplified following the meeting of the Investors Club of the Republic of Tatarstan, held in the reconstructed by the Turkish investors cultural heritage object "Shamovskaya hospital". A large-scale investment activity of the Republic is in woman's hands and the youngest member of the Tatarstan Government. "2018 was certainly a successful year for us. We note an increase in investment in fixed capital, including from extra-budgetary sources. In addition, we have not only investment growth, but also the geography of countries-investors", - the Head of Tatarstan Investment Development Agency Taliya Minullina shared. Certainly, as investors note, support of the President of Tatarstan Rustam Minnikhanov is invaluable. "Such sights as Investors Club are very important for the government to understand the worries and problems business has. The form of communication should be partnership. We need to meet the interests of everyone. Taliya Minullina is an active member of the Government, she really tries to do something unique, and succeeds in this," - Rustam Minnikhanov stressed. The President also noted that the object of Turkish investors - the 5-star hotel "Kazan Palace Hotel by Tasigo" - would be in demand, as everything was done with taste and dignity, and solemnly handed in the Letter of Gratitude of Tatarstan President to the Chairman of the Board of Directors of "Polimeks Group" Cem Siyahi. This year, along with Turkey the following countries invested in Tatarstan: the USA - 146 866,8 thousand dollars (1st place), Germany - 108 513,4 thousand dollars (2nd place), Turkey - 46 813,7 thousand dollars (3rd place), China - 34 019,4 thousand dollars (4th place) and others. General Consuls of foreign countries in the Republic of Tatarstan were among the honored guests of the Investors Club. Heads of public authorities told about the work done on investment promotion. Following the results of the designated areas and issues that require additional work, President Rustam Minnikhanov formed a number of instructions. 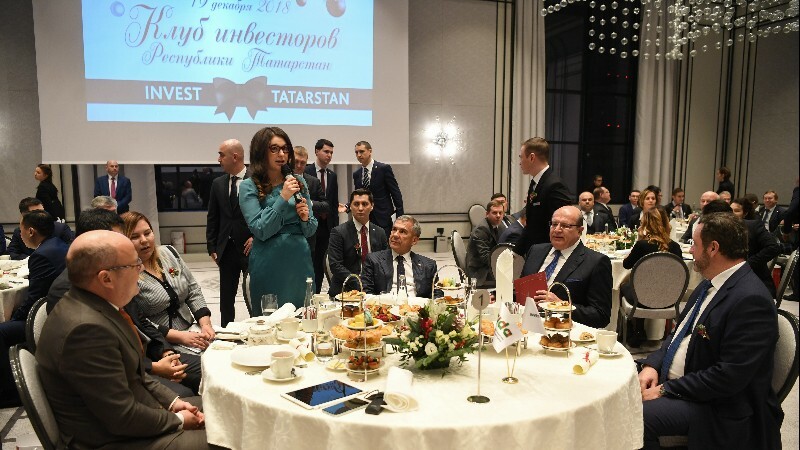 Heads of large enterprises of Tatarstan thanked the first persons of the Republic, presented plans for 2019 and expressed readiness for cooperation. "Tatarstan is a unique platform. In no other region have I seen an event like the meeting of the Investors Club today. We are ready to participate with you in a wide range of projects, whether retail chains, hospitals, highways. There are no restrictions," -, Deputy CEO of the Russian Direct Investment Fund Alexander Malakh addressed the entrepreneurs. Director General of "Haier Electrical Appliances" LLC Wan Shouzhun thanked the President of Tatarstan for the trust and opportunity of development at the territory of the republic. This year, one of the leading investors - the Chinese company Haier - laid the first stone in the foundation of the washing machine plant in Naberezhnye Chelny. 2018 had indeed become for Tatarstan full of events and opening of new facilities. The galvanic production of PJSC "Kazan helicopter plant" was opened. The opening of joint scientific and research center of Ericsson and MTS companies took place in the city of Innopolis. Schneider Electric Innovation Center was also established in Innopolis. "ICL Techno" company launched a technopark on the second sight of SEZ "Innopolis" in Laishevo district of Tatarstan. In Kazan, a specialized competence center "Siemens PLM Software" was opened on the basis of the German-Russian Institute fro Advanced Technologies KNRTU-KAI. The first in the Volga region service metal center "MMK-Coşkunöz-Alabuga" was established. The amount of investment in the project exceeded 1 billion rubles. The production lines for the manufacturing of the substrate of rock wool for crop production "Grodan" of Rockwool palns was launched, etc. Along with the representatives of the mentioned companies, the Director General of "Aqua Region" Ltd. Evgeniy Weiner, Director General of "Iida Sangyo Rus" Ltd. (Kazan) Oshio Hirofumi, Director of "YIT - Kazan" Ltd. Vladimir Sorokin, Regional Director of "Lenta" Ltd. Olga Kolganova, Director General of Advenira Enterprises (Kazan) Andrey Petrov, Director General of "Portavita Health" Mark Sluter, residents of SEZ "Alabuga" and SEZ "Innopolis", as well as all the largest participants of business-processes on the territory of Tatarstan participated in the meeting of the Investors Club. In the frames of the event the preferences of ADZs and SEZs, measures of state support of the investors were carefully studied and pitch sessions were held, where the residents of SEZ "Innopolis" and Technopark in the sphere of high technologies "IT-park" presented their ideas to the potential investors. The opportunities for doing business on the territory of the International Exhibition Center "Kazan Expo" were also represented to the members of the Investment Club. At the end of the official part of the event, informal negotiations of investors took place, the results of which we will be able to see in 2019 represented by new business partners and projects. As the guests noted, the meeting of the Investors Club was held in a festive atmosphere. Everyone received a new year gift and predictions for 2019, which promise only good news from Tatarstan in the new year. Investing is good, and investing well is even better! Invest in Tatarstan!